Free download RollBack Rx Professional latest version 10.5. RollBack Rx™ is an instant time machine for your PC. A Comprehensive Windows System Restore solution that empowers users and IT administrators to easily restore their PC’s to any previous state within seconds!!! Windows System Restore only restores Windows system files and some program files. In addition, if Windows crashes to a point were Windows itself cannot boot up (ie. BSOD*) you would not be able to access your Windows System Restore points. In contrast, the RollBack Rx technology works at the sector level of the hard drive and restores everything! Right down to the last byte of data. It sits below Windows. So even if Windows crashes, there is a sub-console (mini OS) that boots prior to windows. This allows you to access Rollback Rx and go back to a point in time when your system was working trouble-free. Most backup techniques (i.e. imaging) are static and time-intensive. So arduous is this task, that even disciplined IT shops seldom get around to making regular backups. And if a disaster were to happen, depending on how long ago the backup was taken – directly determines the amount of data loss. In today’s computing environment 98% of PC disasters are micro-disaster (ie. malware, botched Windows updates, software installations etc.) How can you protect yourself from the vast majority of PC disasters? 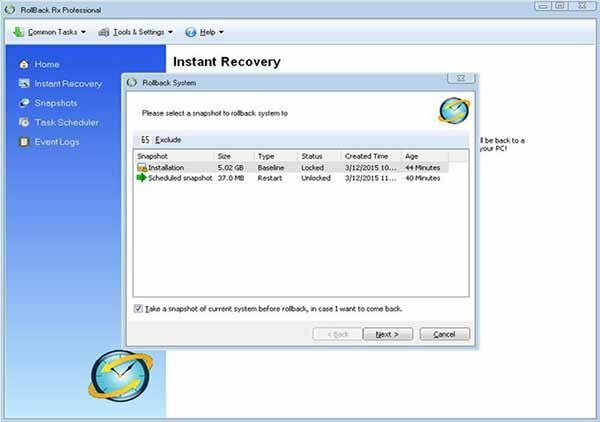 RollBack Rx is a dynamic instant restore solution. It can be automated to take snapshots silently in the background. Each backup snapshot only takes seconds. And when you want to restore your PC, you can quickly return to any previous state in the amount of time it takes to restart your PC.